First of all, it should come as no surprise that I have a liking for Elvis in 1977. This release from Southern Comfort...Style has been awaited in my house for a long time, even before the time it was announced. Both concerts featured on this bootleg was used by Fort Baxter to their 'A Profile' (Only S. Nielsen) and 'Moody Blue And Other Great Performances' ('Polk Salad Annie', 'Where No One Stands Alone', 'Unchained Melody' and 'Can't Help Falling In Love') respectively. From those two bootlegs I knew that the quality of these soundboard tapes was top-notch; in stereo and well balanced. I had high hopes for this specific release. I am not yet disappointed! At least when it comes to the sound quality. It is simply awesome! It beats BMG by a quarter of a mile. OK, as said above, I knew that the sound quality would be good. The sound on the tracks released by Fort Baxter sounded great. Fort Baxter has always been known for their high quality soundboards. Southern Style just has an even better way to make the best out of something good. The result is amazing! Now it is time to look at the content. This bootleg starts in the middle of 'Little Sister' from West Palm Beach. What sounds to be a fairly standard version actually has minor sound problems. No major thing, but the sound comes and goes a little bit, and the stereo changes channels along the way. On 'Little Sister' you can hear right away that this will not be a great concert. Next up is 'You Gave Me A Mountain'. Even here, there are some sound problems as mentioned above. This is not a good version. Then Elvis performs 'Blue Suede Shoes'. This version is terrible, really! By now, you can tell for certain that this definitely is a blue February evening in West Palm Beach... 'It's Now Or Never' is boring. 'My Way' is up next. Pretty standard version. Elvis never really sang a bad version of this song, but he is close this day... 'All Shook Up' can be described as pathetic, while 'Teddy Bear/Don't Be Cruel' holds no surprises. 'And I Love You So' is a fair delivery. The same goes for 'Fever'. On 'Fever' you can hear the audience quite clearly as they cheer along. 'Blueberry Hill' is strange. Piano player Tony Brown can not be compared to Glen D. Hardin when it comes to follow Elvis impromptu ideas. This is very noticeable on for instance Elvis' attempt to sing 'Blue Hawaii' some months later in Ann Arbor (released on A Profile). The same goes for 'Blueberry Hill'. Tony Brown plays the song in a key way above what Elvis can follow. This version is really chaotic. Now I fully understand why Elvis the next day in St. Petersburg throws Tony away from the piano, to show him how to do it right. The result in St. Petersburg was a lot better. On 'Hurt' you can't help but notice Elvis' tired voice. 'Hurt' was not a good choice this day... Southern Style has chosen to omit the two S. Nielsens number from West Palm Beach. Instead the bootlegs jumps right from 'Hound Dog' (feature some editing) to 'Jailhouse Rock'. Elvis ends the concert with the line "Wise men knows when it is time, time to go..."
From 'Closing Riff' in West Palm Beach the CD goes directly to 'You Gave Me A Mountain'. 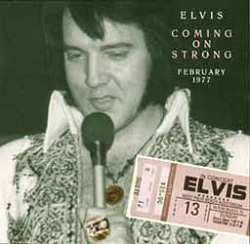 We are now listening to Elvis in Montgomery, Alabama, February 16. This concert is a completely different story in my point of view. Tony Brown has to follow corrections from Elvis this day also. The piano sounds off-key. You can spot this in several places, and it certainly is so when Tony starts 'Teddy Bear/Don't Be Cruel'. Elvis has Tony do the start three times. I can't hear any difference between those three. All are off-key. 'My Way' is a magnificent version. At this time Elvis had slowed down the tempo quite a bit. In my view Elvis sings this song too fast in December 1976 (A Hot Winter Night In Dallas, and Burning In Birmingham). Even this day it is a bit too fast for my liking, but definitely much better than before. Right after 'My Way', Elvis jumps into one of the most fascinating versions of 'Polk Salad Annie' I have heard. This version really cooks. Available on Moody Blue And Other Great Performances some years ago, but sounding even better on Coming On Strong. 'Hurt' is nothing really special, although it is sung much better than in West Palm Beach a few days ago. After 'Hound Dog' someone in the audience must have given Elvis a piece of woman-clothing. Elvis says it is too big for his daughter Lisa, and then asks Kathy to try it on; "It will fit you perfectly...". This incident generates some laughter on stage. Right after this Elvis decides to sing 'Where No One Stands Alone' for the first and the last time ever. This song has also been released before, but again...it sounds better on Coming On Strong. Elvis ends the concert in Montgomery with 'Unchained Melody'. Not among my favorite versions, but still.... a lot better than in December 1976. There is only one problem with this bootleg...the content. It gets a bit tedious in the long run to listen to the same song twice in a few minutes. Two versions of things like 'Teddy Bear/Don't Be Cruel', 'O Sole Mio/It's Now Or Never' don't get your juices running... Still, I really welcome this bootleg. Here we have a great version of 'My Way', a solid 'Polk Salad Annie', a strange 'Blueberry Hill', and a "once in a lifetime performance" of 'Where No One Stands Alone' and finally one of the first versions of 'Unchained Melody' from 1977. All in smashing sound! The artwork of this bootleg is a bit disappointing. No information unless the track listing. Three or four medium quality pictures, and the back cover show Elvis boarding his plane early 1976?! Compared to Southern Styles other release Finding The Way Home, the artwork of this one is lousy! Reviewed by Oven Egeland, Elvis In Norway. Thanks to Crister Berge for some language advice.